-Keep your edge needles in good working order and, when you deep clean your machine, swap the centre and edge needles around, to even out the wear and tear. On the Silver Reed machines, keep your side racks in tip-top condition, these are essential for pattern knitting on the full bed. 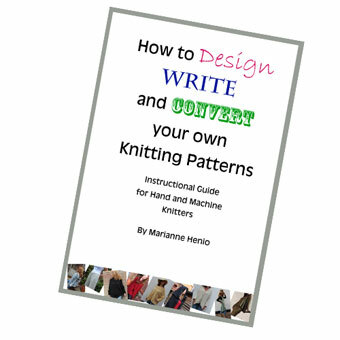 -Know your yarns and what your machine will knit. Check the gauge ranges for the yarns for your machine. Don’t necessarily rule out the thinner yarns, if you want to use them. -ALWAYS ALWAYS knit a tension swatch. 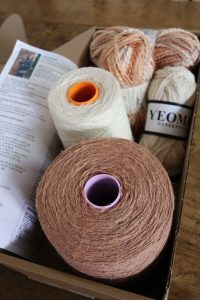 -We commonly stick to 4 ply on a standard gauge, but some DK yarns will produce an acceptable result, needing fewer stitches per inch, and this increases the size range in stocking stitch up to 64 inches on the standard gauge. -Experiment with different stitch patterns. 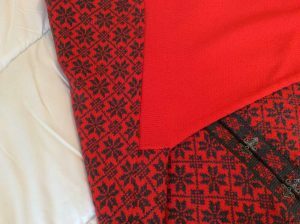 It is common knowledge that tuck produces a wider fabric, and fairisle a narrower one. Take a cone of 4 ply, from which you can knit a regular stocking stitch swatch at 28 stitches / 40 rows to 10 cm, and make a series of samples using tuck, slip, weave, fairisle and – if you have a lace carriage – lace. Compare the gauge readings for the different types of stitch. Be aware that some hand manipulation techniques, such as cables will narrow the fabric. All is not lost with these, however, as there are other ways around it. -Alternatively, if you have a garment that fits you well, you can use this as a template. Lay it flat and measure it, as above. -Know how much ease you will want for each garment. On some, an extra 2 inches is enough, on other garments, especially outer wear, you will probably need another 4 or even 6 inches. Even when fashion trends indicate baggy is “in”, I tend to avoid it, as it’s not particularly flattering. -If you have a big difference between bust and hip sizes, consider either tapering or flaring the body shape slightly to make the fit more flattering. -Keep shapes simple, at least to begin with, and avoid fussy detailing. My favourite shape has a slightly inset sleeve at the armhole, and then straight up to the shoulder. It is the easiest shape to adjust to various sizes, and by insetting the sleeve, avoids having that shoulder seam drooping down to the elbow. 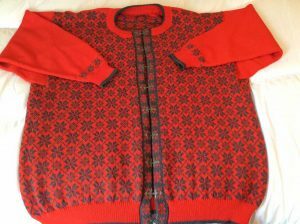 -The inset sleeve garment also offers an opportunity to increase width easily, especially on cardigans, by moving the side panel from the garment back to be knit alongside the front. 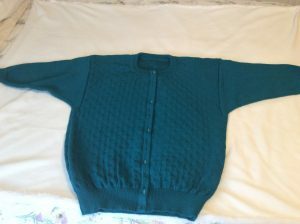 On a sweater, you can cut both side panels from the front and back, and knit a separate insert. Careful mattress stitching should make this hard to detect, and pay attention to setting in the sleeves tidily. 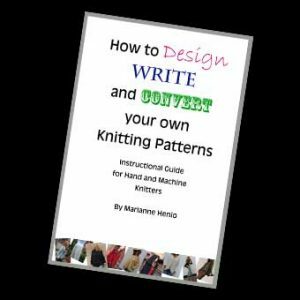 -Sideways knitting – no width restrictions here! 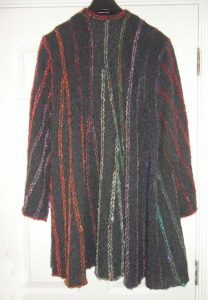 The length is then the limiting factor, so long coats aren’t an option, but this is an excellent design choice for many garments. The length can be stabilised using tuck and/or knitweave, and partial knitting enables flared and fluted fabrics. The sky’s the limit with sideways knit. -Look through catalogues and magazines for design ideas. 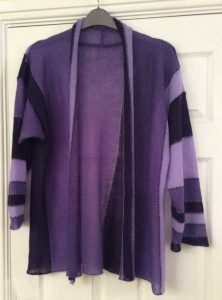 I’ve seen a lot of colour block knitwear around, and these can be broken down into panels or blocks for knitting and assembly later. You can make a feature of the joins with loop through loop seams, adding cords, crochet trims, giant cross stitch, etc. The construction is then part of the design. -Check commercial patterns for the ways in which they scale up the sizes. Be aware that past a certain chest width (about 50/52 inches), you shouldn’t necessarily increase the sleeves and neck to the same scale, otherwise the top of your garment won’t sit correctly. Check the neck to cuff measurement to make sure you aren’t knitting the sleeves too long. Remember men’s garments usually need longer sleeves and bodies compared to women’s. -I draw pattern shapes on paper – they aren’t to scale – and note down the stitches, rows, measurements, increases, decreases etc. If you struggle to work small scale, draw a full size pattern on wallpaper lining. These are cheap rolls of plain paper, ideal for pattern drafting. You can then use rulers in real size to work out the pattern details. I hope these hints are useful and will encourage more large ladies (and gents!) to experiment with their machines.